The Fulton Street Trade Card Collection consists of 245 late 19th and early 20th century illustrated trade cards, all emanating from businesses in Brooklyn's historic commercial thoroughfare. The cards combine humor, bright and elegant graphic design and typography to promote a wide variety of wares and services. The Fulton Street trade cards are among the many collections held by the Brooklyn Collection, Brooklyn Public Library's local history division, and the world's largest public archive for the study of Brooklyn's social and cultural history. Brooklyn Public Library provides online access to Brooklyn's historic newspaper of record, The Brooklyn Daily Eagle from 1841-1902. Brooklyn's daily newspaper ran for 114 years, from 1841 to 1955. Winner of four Pulitzer Prizes, the newspaper printed local, national and international news, keeping offices in Washington, London and Paris. Brooklyn Public Library provides online access to Brooklyn's historic newspaper of record, The Brooklyn Daily Eagle from 1841-1902. Brooklyn's daily newspaper ran for 114 years, from 1841 to 1955. Winner of four Pulitzer Prizes, the newspaper printed local, national and international news, keeping offices in Washington, London and Paris. 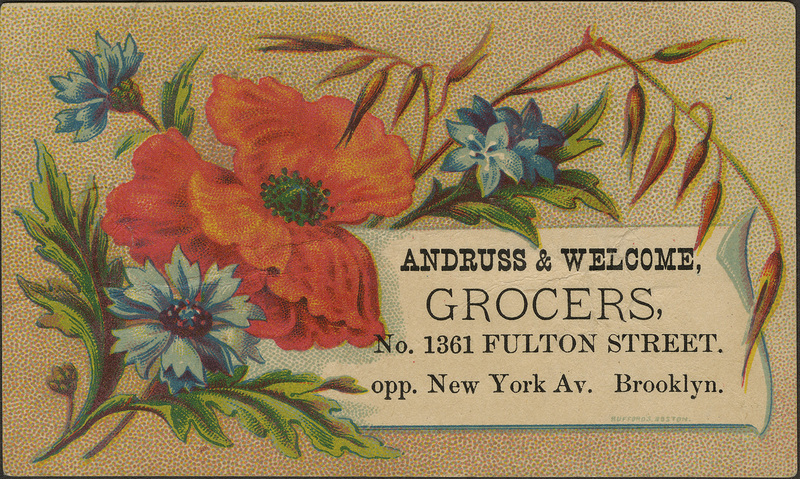 Many Fulton Street Trade Cards have links to related articles in the online repository.